The courses I teach tend to be very practical and applied. My teaching philosophy is founded on helping my students acquire employable skills. Writing solid, robust, concise and easy-to-read analytical summaries should be an acquired tool that they then can transfer to other fields. Politicians, bureaucrats and high-level people in government that I’ve talked to have always considered summarizing information a great tool that undergraduate and graduate education should provide. Yet, the online resources I found to help students summarize journal articles and write critical reviews left me wanting. a) Dr. Karen Beckwith (Case Western Reserve University) shared with me her handouts on critical reading. Professor Beckwith is incredibly generous and I’m sure she would share them with you if you requested them. They are very useful because they are tailored to each specific course she teaches. She also has a guideline on how to learn from movies. b) John McMahon (CUNY) shared with me some of his handouts, which are posted online, including this one on critical reading and note-taking. John and I have a different view on highlighting journal articles, and I will write a blog post on this soon. c) Tressie McMillan Cottom (Virginia Commonwealth University) shared with me her notes from a grad seminar with Regina Werum at Emory University. 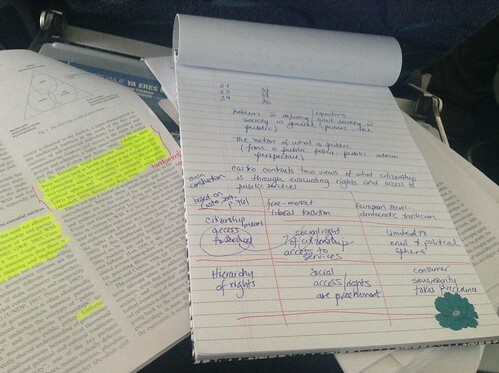 Professor McMillan Cottom’s notes are a summary of how to read a sociology article. d) Dr. Neenah Luna-Estrella (NEU) suggested the following books to help students learn how to read and summarize scholarly (and not so scholarly) works. Not online resources, but still, very good ones. Pyrczak, F. (2014). Evaluating research in academic journals (6th ed.). Glendale, CA: Pyrczak Publishing. Harris, R. A. (2011). Using Sources Effectively (3rd ed.). Glendale, CA: Pyrzak Publishing. - University of the Fraser Valley Writing Centre’s guide to summarizing an article – this is particularly good because UFV is primarily undergraduate teaching. - Donna Vandergrift ’s handout actually gives a guideline for students on which content should be written in each paragraph. This kind of detailed guidance is fundamental. - This guide on how to read a journal article is a bit long, but it does have some additional references that you can look at. I’m happy to continue compiling resources if you want to drop a comment on this post or send me an email (sometimes my commenting system isn’t the best). Posted in academia, teaching, writing. Tagged with journal article summaries, teaching, writing. Valuable info! Thank you for sharing!